Lucie Blackman—tall, blond, twenty-one years old—stepped out into the vastness of Tokyo in the summer of 2000, and disappeared forever. The following winter, her dismembered remains were found buried in a seaside cave. Richard Lloyd Parry, an award-winning foreign correspondent, covered Lucie's disappearance and followed the massive search for her, the long investigation, and the even longer trial. Over ten years, he earned the trust of her family and friends, won unique access to the Japanese detectives and Japan's convoluted legal system, and delved deep into the mind of the man accused of the crime, Joji Obara, described by the judge as "unprecedented and extremely evil." The result is a book at once thrilling and revelatory, "In Cold Blood for our times" (Chris Cleave, author of Incendiary and Little Bee). 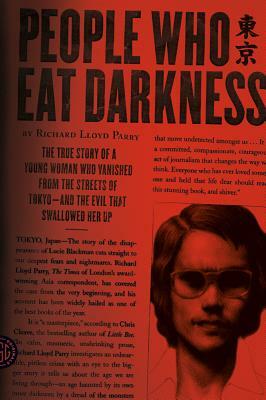 Richard Lloyd Parry is the Asia editor and Tokyo bureau chief of The Times (London) and the author of People Who Eat Darkness and In the Time of Madness.